Twitter may some day get baked into the very fabric of Mac OS X, allowing you to tweet from Safari, Mail, or even the Finder. If you want to easily tweet photos from iPhoto or Aperture in the meantime, though, Blue Crowbar Software has a couple of plugins for you. iPhoto2Twitter (€5) and Aperture2Twitter (€6) offer exactly what the names promise: easy tweeting of photos and even videos if you use iPhoto. Both offer pretty straightforward features and allow you to post one piece of media with a short message. Photos can be posted to either the TwitPic or Mobypictures media-hosting sites. The former is one of the most popular Twitter-optimized photo sharing sites, while iPhoto users may prefer Mobypictures' support for videos. TwitPic has a file size limit of 4MB, while Mobypictures allows up to 16MB to account for videos, but the plug-ins let the user determine what size image to upload. Both plugins have demo versions available, but they embed a watermark and are limited to posting at 500 x 500 pixel dimensions. They also require Mac OS X 10.5 Leopard and are Universal. 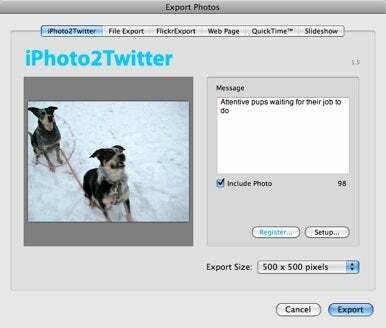 iPhoto2Twitter requires iPhoto '08 or '09, while Aperture2Twitter requires Aperture 2.